Needless to say, I didn’t have a lot of choice here. Qiu Xiaolong (born Shanghai, China, 1953) is an English-language poet, literary translator, crime novelist, critic, and academic, currently living in St. Louis, Missouri, with his wife Wang Lijun and daughter Julia Qiu. He originally visited the United States in 1988 to write a book about T. S. Eliot, but following the Tiananmen Square protests of 1989 a newspaper reported on his previous fundraising efforts for Chinese students, and he was forced to remain in America to avoid persecution by the Communist Party of China. He has published six crime-thriller/mystery novels set in Shanghai in the 1990s at the point when the People’s Republic of China is making momentous changes. These include Death of a Red Heroine, which won the Anthony Award for best first novel in 2001, and A Loyal Character Dancer. All books feature Chief Inspector Chen Cao, a poetry-quoting cop with integrity. But the main concern in the books is modern China itself. Each book features quotes from ancient and modern poets, Confucius, insights into Chinese cuisine, architecture, history, politics, herbology and philosophy as well as criminal procedure. Xuē Xīnrán (薛欣然, pen name Xinran, born in Beijing in 1958) is a British-Chinese journalist, broadcaster and writer. They’re both expat Chinese. Xinran has moved to the UK while Xiaolong now lives in the USA. I am very interested in reading this Chinese author now. Thanks for sharing this informative bio. 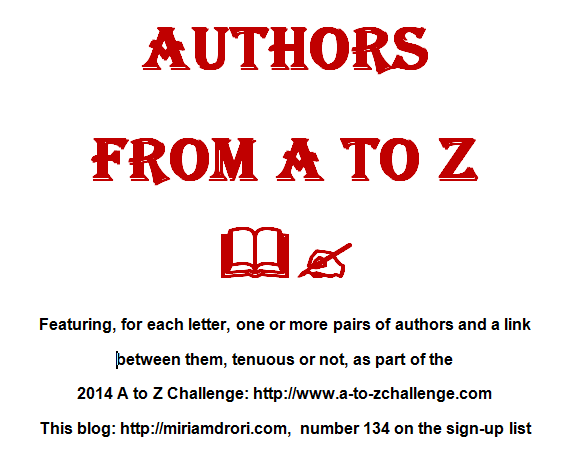 I am visiting from the A to Z challenge.